The private sector led hiring last month, and despite a modest reduction of government staff, the economy added 257,000 jobs. New employment was diversified, with substantive gains in both the education and health services, and trade, transportation and utilities sectors. Manufacturing also made headway, with durable-goods producers hiring 18,000 workers in January. Consumer purchases of long-lasting items such as automobiles are rising and will sustain manufacturing activity. Leisure and hospitality staffing expanded by 37,000 workers, primarily at bars and restaurants. Overall, hiring has been remarkably steady with the combined total of the last three months exceeding 1 million jobs — the first time that has happened since 1997. Falling oil prices, a boon to the broader economy as consumers pay less to fill gas tanks, weighed on natural resources and mining employment. The sector lost 3,000 workers last month, with losses concentrated in oil and gas extraction, and drilling support activities. Should the price of oil remain low, companies will likely decommission more rotary rigs following last month’s shutdown of 200 facilities. U.S. oil production, however, remains elevated compared with years past, a trend that will persist in the near term as producers work their most cost-effective wells. Retailers hired nearly 46,000 employees last month as consumption maintained momentum. 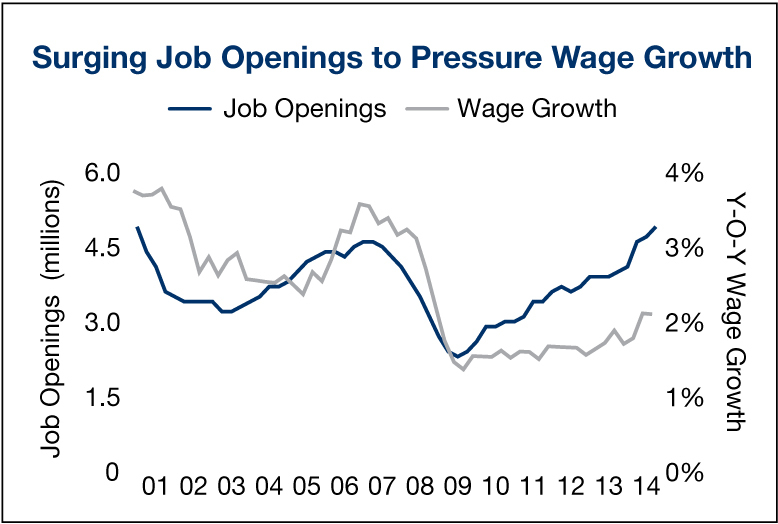 Retail job openings have reached an all-time high, signaling additional store openings in the coming months as retailers step up the pace of expansion. This year, retailers will absorb nearly 88 million square feet of space to slash nationwide vacancy 60 basis points to 6.0 percent, a level on par with the peak of the last cycle. Average rents will advance 2.5 percent as leases set during the recession come up for renewal and adjust to market rates in a much lower vacancy environment. Professional and business services, and financial services payrolls continue to expand, helping to fill additional office space. More than 1 million positions are unfilled, signaling increased demand for space. As companies grow, they will need larger office layouts, lifting absorption trends. The tight construction pipeline, dominated by build-to-suits and generally only occurring in the healthiest markets, will help support performance trends. This year, the national office vacancy rate will tighten by 80 basis points to 14.5 percent, the lowest year-end level since before the recession. This entry was written by marcusmillichap, posted on February 18, 2015 at 9:57 pm, filed under Uncategorized and tagged Commercial Real Estate, CRE, Employment, Job Openings, Wage Growth. Bookmark the permalink. Follow any comments here with the RSS feed for this post. Post a comment or leave a trackback: Trackback URL.